Students who survived the Florida school shooting have strongly rejected the idea of arming teachers. Suzanna Barna, a pupil from Marjory Stoneman Douglas High School where 17 died in a gun attack last month, told an education conference: "More guns is not the answer." A fellow student, Kevin Trejos, said arming teachers would mean extra risk and a greater chance of accidents. President Donald Trump has said armed teachers could quickly stop attacks. On Wednesday, students across the United States staged a walkout from classes, in a commemoration marking one month since the attack. There were calls for action to prevent further gun violence - but President Trump has suggested that arming school staff could provide greater safety. 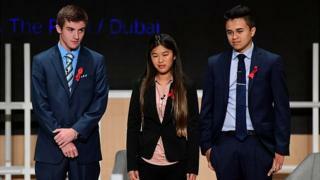 "We've spoken to the teachers at our school and none of them think it's a good idea," said Lewis Mizen, a student at the school in Parkland, Florida. "The universal message, from anyone with any common sense, is that no-one wants this," he told the Global Education and Skills Forum. "It completely changes the environment in which education is given. I for one wouldn't feel comfortable knowing my teachers were carrying around guns." Originally from Coventry in the UK, Mr Mizen said "playing videogames was my only experience of guns". "The idea that teachers would have to put their lives on the line for their students, isn't something that really comes into consideration in England. "Teachers shouldn't be the first line of defence from a rampant gunman on campus," he told the conference in Dubai, which will see the award of the Global Teacher Prize on Sunday. He promised that the campaign over gun control would continue beyond the current wave of protests. Mr Trejos told the conference: "Every single gun poses greater risk." He warned that if teachers had firearms in schools there could be accidents or guns could be seized or stolen, adding to the danger rather than reducing it. In the wake of the shootings, Ms Barna said it was still hard to "acknowledge the reality of what happened". The "hardest day", she said, was "going back to see the empty desks". An education project in the US has been tracking school shootings, in an attempt to stop people becoming "desensitised" to such attacks. So far there have been 69 people killed or injured in school shootings since January, according to the Education Week tracker. There have been two more firearm incidents in schools since the attack in Parkland. The most recent, in California this week, saw injuries to three students caused by an accident during a gun safety lesson.